Cardiac angiosarcoma (CA) is the most common primary malignant heart tumour. Its atypical symptoms and rapidly progressive nature contribute to delayed diagnosis and poor outcome. European Federation of Internal Medicine reports the case of a 52-year-old woman admitted with a large pericardial effusion. An extensive study of the aetiology of the pericardial effusion was inconclusive. Two months later the patient returned with ischaemic stroke. An echocardiogram revealed a probable right atrium contained rupture. The patient was submitted to surgical correction but died 9 days later. Histology revealed an angiosarcoma. This case exemplifies the atypical presentation of CA and highlights the importance of a multimodal diagnostic work-up in patients with idiopathic pericardial effusion. Cardiac angiosarcoma (CA) is the most common primary malignant heart tumour. Its atypical symptoms and rapidly progressive nature contribute to delayed diagnosis and poor outcome. European Federation of Internal Medicine reports the case of a 52-year-old woman admitted with a large pericardial effusion. An extensive study of the aetiology of the pericardial effusion was inconclusive. Two months later the patient returned with ischaemic stroke. An echocardiogram revealed a probable right atrium contained rupture. The patient was submitted to surgical correction but died 9 days later. 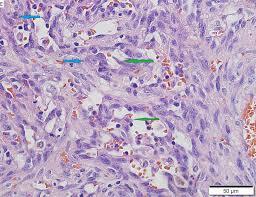 Histology revealed an angiosarcoma. This case exemplifies the atypical presentation of CA and highlights the importance of a multimodal diagnostic work-up in patients with idiopathic pericardial effusion.